At Manchester, we are developing tools and techniques for teaching industry relevant software engineering skills, by packaging our existing expertise and through new learner analytics to generate new expertise. 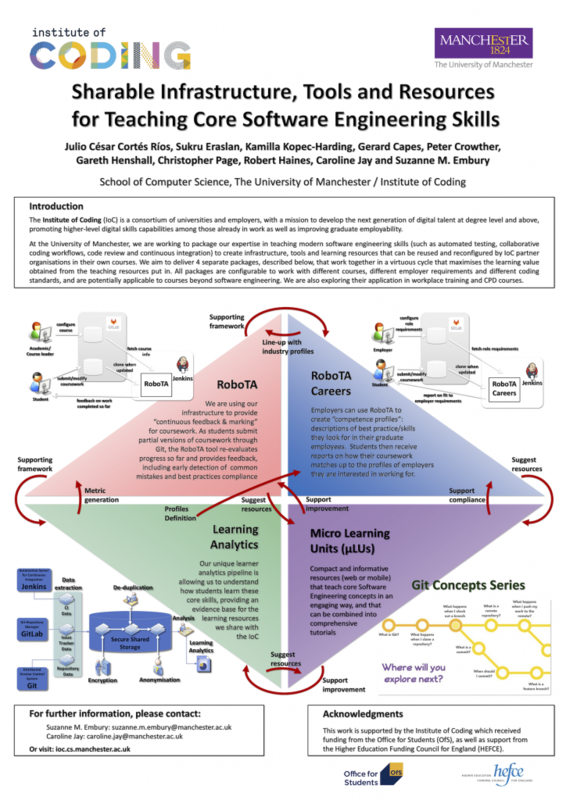 Julio, Sukru and Suzanne recently attended the IoC annual conference in Manchester, where we presented a poster on the four main components we are creating for the Institute of Coding. This month, we gained a new member of our IoC team. Dr Sukru Eraslan joined us from the Middle East Technical University (METU) as a PDRA working on our Learning Analytics Pipeline for Software Engineering. Sukru’s PhD, and later post-doctoral work, is on eye tracking for understanding how people navigate the Web, to help make it more accessible. We’re looking forward to using his skills in empirical analysis of how students learn core software engineering concepts, and running user trials in assessing the usefulness of the outputs of our analytics pipeline. Welcome to the Institute of Coding, Sukru! Happy 1st Birthday, Institute of Coding! We also celebrated two new members joining our team. Kamilla Kopec-Harding is our data science expert. She’ll be working on our learner analytics platform, helping us to understand how undergraduates learn core software engineering concepts, so we can devise more effective teaching materials. Peter Crowther was recently awarded his PhD from the University of Bristol. He joins the team as a research software engineer, and will be writing Python code to extend our RoboTA prototype to support our second semester course units. He’ll also be working on adapting RoboTA to get our industry competence profiles up and running. Welcome to the team, Peter and Kamilla! 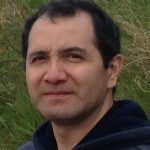 We are pleased to welcome Julio Cesar Cortes Rios to the Manchester IoC team, as a post-doctoral research assistant. Julio is an experienced software architect and manager, who has worked on a range of projects, including fingerprint recognition and biometrics systems for the Mexican Government. He holds a BSc and an MSc in Computer Science from Universidad La Salle, Mexico, and a PhD in Computer Science from the University of Manchester. 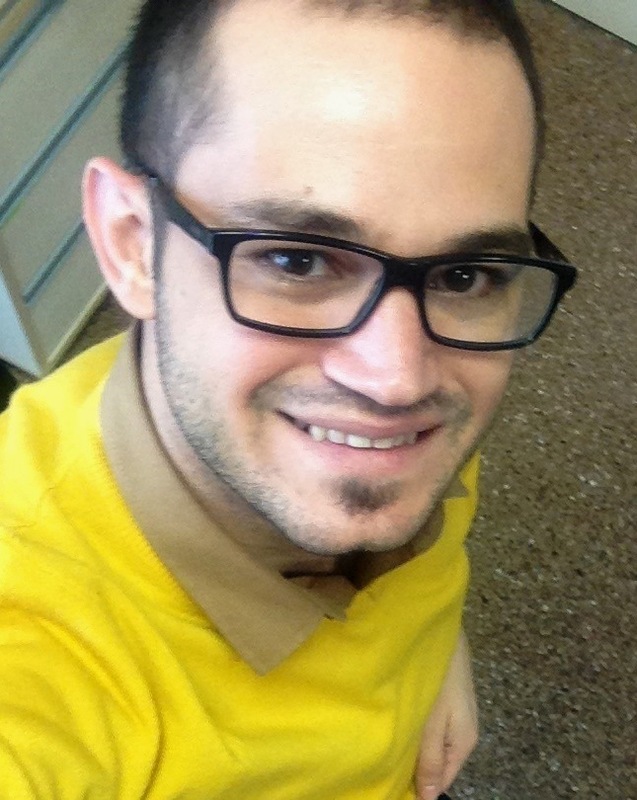 Julio will be dividing his time between the design and evaluation of the RoboTA continuous feedback and marking system, and work on our new learner analytics platform for software engineering. Welcome to the team, Julio! As part of our contribution for the Institute of Coding, we are working to package our existing teaching resources for reuse by others providing software engineering education and training. The first of these offerings is now available. 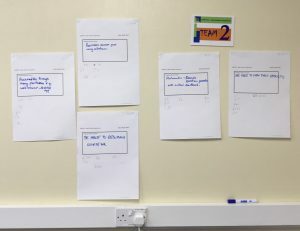 The Agile Value Hunt Game is a coaching game we have developed for use on our third year UG elective course on Agile Software Engineering. The game is used at the start of our workshop on agile approaches to requirements gathering, to help our students focus on understanding and delivering real value for customers. If you make use of this game in your teaching, and have comments or suggestions for how the game or the instructions could be improved, please do get in touch. We’d love to hear from you. The Institute of Coding was formally launched with an event in the Peers’ Dining Room at the House of Lords, on 21st June 2018. Representatives of the academic partners met with industry stakeholders, current digital skills learners and government, to discuss the UK’s digital skills needs and how they might be met by the Institute. Baroness McGregor-Smith CBE hosted the event. Over the summer, Chidera Unigwe joins our team as a vacation project student. 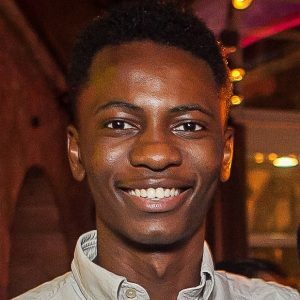 His task is to develop an intelligent trouble-shooter wiki to help our students deal with problems they encounter in our software engineering labs. Our second year software engineering course units require our students to get to grips with an industrial strength toolkit very quickly, including Git, GitLab, JUnit, Ant, Maven, Spring, Jenkins and Eclipse. Chidera will take staff expertise on the kinds of technical problems encountered, and their solutions, and convert them into a self-help resource that all our students can access whenever they need. The trouble-shooter will be in use by our students from September 2018 onwards. Welcome to the team, Chidera! The University of Manchester is pleased to be part of the consortium that was awarded the contract to set up the new Uk Institute of Coding.